Bedih Yoluk was known as Kazancı Bedih because of his profession of boilersmith (kazancı). But the name stuck when he gained nationwide popularity in the 1990s. Şanlıurfa province in southeastern Turkey has such a colorful and deep culture that any given person from Şanlıurfa is expected to be able to sing, make delicious dishes with any material provided and utter very authentic idioms when speaking, not to mention the sweetest dialect. Yet, the most famous cultural product of Şanlıurfa is the "uzun hava," (literally "long air") a slow and heavy tune with lyrics coming from the diwan tradition. In fact, the uzun hava is the sung form of the ghazal, the Turkish poetry genre resembling the English ode. Şanlıurfa is famous for many talented ghazal singers, including Nuri Sesigüzel, İbrahim Tatlıses, Müslüm Gürses (all three adopted stage names including "ses," which means "voice," referring to the beauty of their voices) and Kazancı Bedih. These are the most prominent ones; however, there are at least a few potential singers in every neighborhood in Urfa, the old name of Şanlıurfa, which is used more than its official name in daily life. Urfa is also known for the local happening named "sıra gecesi." Literally "row night," the sıra gecesi is a local gathering of male friends in order to entertain themselves on long winter nights. Some read books and tell tales, while others show their acting and singing skills. The sıra gecesi came to light in the 1980s thanks to Yavuz Turgul's film "Züğürt Ağa." Private TV channels had many special shows using the sıra gecesi as scenery. Some even used the name "Sıra Gecesi" or "Urfa Gecesi" (Urfa Night). Of course, these shows omitted the reading, acting and speaking parts of the local sıra gecesi. TV used only the musical session of the sıra gecesi, where singers and instrument virtuosos sing and play their best songs for the sake of entertainment. In the late 1990s, one of those music night shows on TV featured a really authentic singer named Kazancı Bedih (Bedih the Boilermaker), who was not a professional singer but a boilermaker. "Kazancı" means boilermaker, and local people used to call him that, which became famous after he appeared on TV. Indeed, we saw his face and heard his voice for the first time in Yavuz Turgul's film "Eşkiya" in 1996, after which he became popular in all sectors of society. He sang the "Nice bu hasret-i dildar ile giryan olayım" (How I weep for longing for my beloved) ghazal of Urfalı Lütfi, a religious scholar and classical poet of Urfa in the late 19th century. Kazancı Bedih was born Bedih Yoluk in 1929 in the Siverek neighborhood of Şanlıurfa. He was the only son of his parents, Halil, his father who was a weaver, and Zemzem, his mother. Bedih himself had seven children, four sons and three daughters. Bedih was a boilermaker, and this became his name for his local friends, which he didn't object to after he became popular nationally after the 1990s. Bedih learned how to become a boilermaker from Hasan Diyar. He also worked with other masters such as the Aziz and Kadir Ucar brothers. After that he served in the army for two years. He was in the Army Band in Elazığ and Bingöl, which shows his music skills were known to others in his youth. Before military service, he contributed to music shows at sıra gecesi happenings. People liked to listen to his uneducated but convincing voice. He also played several local musical instruments, including the "cümbüş" (a Turkish stringed instrument, which is similar to the American banjo, invented and named by Zeynel Abidin Cümbüş in 1930), the oud and the tanbur (two other stringed lutes). After his service in the military, Bedih returned to Urfa and continued to work as a boilermaker and would play and sing on liturgic and secular occasions. He would sing religious or secular odes to people with his bass but somehow smooth voice. Bedih found a job in the local municipality where he retired in 1986. This helped him became notable in his province and region. He was a regular at sıra gecesi gatherings. 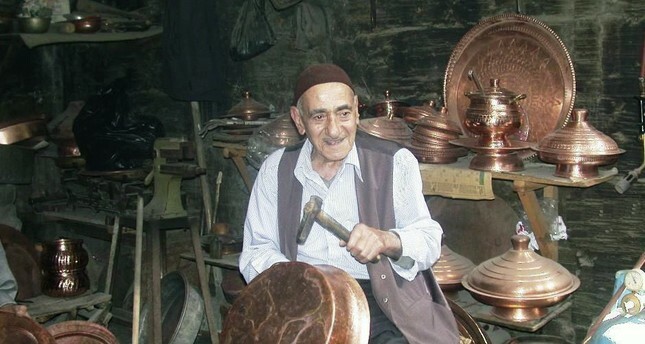 After retired from the municipality, Bedih returned to the lounge and began fixing tea and coffee pots. He also traveled to Mecca to fulfill his hajj. Bedih didn't make any recordings. On the other hand, he sang for others' amateur tape recordings hundreds of times. He generally played and sang with his team including his local friends. A typical setting for "sıra gecesi," where local musicians sing and play music. Though his name became popular after he appeared in cinema and TV, Kazancı Bedih changed nothing in his life. He would perform his art for the media and return to his family and job in Urfa. He never asked for money, though he was paid small amounts occasionally. Bedih taught many local singers how to sing difficult ghazals. Besides, popular artists like İbrahim Tatlıses and Selahattin Alpay imitated his style when singing heavy ones. Bedih was the best when it came to singing the ghazal poems of such great classical poets as Fuzuli, Nabi, Abdi, etc. Although he became very popular and sought by the media in the 2000s, Kazancı Bedih never showed any intention of changing his way of life. He lived a moderate life in Urfa with his wife. Unfortunately, both of them died on a cold night due to a gas leak from the heat stove on Jan. 20, 2004, which saddened the whole nation.